Some might argue with my choice on this. 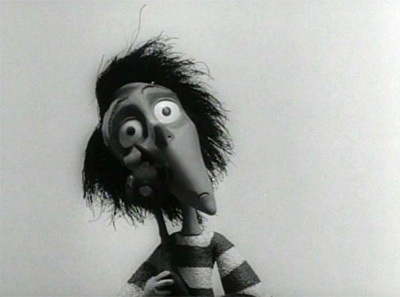 Yes, I know that Tim Burton is hardly an indie or little-known artist. Having your name associated--often--with a certain Mr. Depp and the cult classic The Nightmare Before Christmas certainly negates the "little" before the word "known". I'm going to insist that this charming little clip qualifies though. 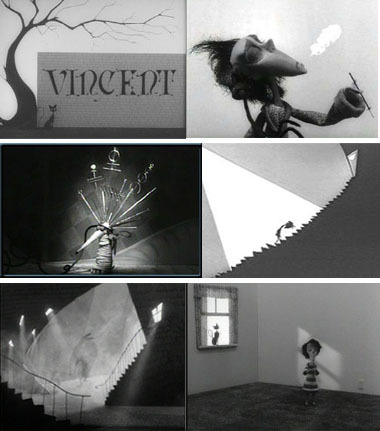 Vincent is a 1982 stop motion film short by Burton and Rick Heinrichs. It follows an imaginative little boy whose ambition is to be "just like Vincent Price". The fact that Vincent Price himself actually narrates is sheer perfection. The opening sequence is sparse and backed by soft, melancholy flute music, setting the mood for the rest of the not-quite-six-minute film. Like many of the creepy, sometimes campy, horror flicks of yore, Vincent is in only black and white. There are a few moments where (like most Burton films) you have to practice suspended disbelief. Vincent is seven, but reads Edgar Allen Poe, and paints a portrait like a master artist. Still, like most things Burton, the journey you're taken on is well worth playing along. Seeing how elements of this film have continued into his later work is fun too. If you're familiar with them, you'll definitely pick up on things that are Corpse Bride and Nightmare-esque. I'm sure it's no secret by now: I'm a big Burton fan. However...I'd venture to guess that the appeal of Vincent will go beyond the large circle of die-hard devotees. Anyone who felt misunderstood as a child (which I imagine is just about anyone walking planet Earth at the moment) can see a glimmer of themselves here. Any parent who has a child who treats their world of make-believe as reality will understand. Any adult who needs just a few minutes of escape and make believe again should find it time well spent. Go ahead--take a break. Reality will always be there when you get back.